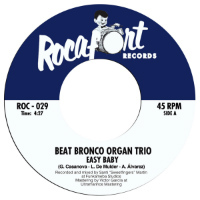 It’s new blood time on Rocafort Records as they release a seven inch from Madrid-based outfit, the Beat Bronco Organ Trio. 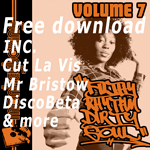 The band’s members are known for having previously played with the likes of the Sweet Vandals and Chip Wickham and their pedigree shows on the two tracks on offer here. A-side Easy Baby is a real treat offering soul jazz at the lower end of mid-tempo on which smouldering organs vie with wah-wah guitar in a contest that builds and builds until it finally reaches a crescendo evoking nothing so much as a blazing sunset over the ocean. Or something. B-side Geriatric Dance on the other hand is indeed a mover and delivers organ-based kicks of the kind pitched somewhere between end-of-the sixties Georgie Fame and classic Blue Note material from the same era.